Touring nationally for thirty years, Joanne Rand “continues to push the art pedal to the floor,” recently completing her 14th CD of original songs: “Still a Real World.” She released her 13th CD, “Stories from the Inside Out,” in 2013, recorded during her 2012 guitar apprenticeship in Nashville with Steve Young, forefather of the Americana genre. Rand has appeared with the likes of Bonnie Raitt, Bob Weir, John Hartford, and recently earned a BFA in Music Composition. Rand’s 2010 CD release was submitted for Grammy nomination by San Francisco Recording Academy’s President. You can’t keep this woman down, her last four CDs were released in the past four consecutive years and in 2012 she toured from border to border. “Whatever muse inspires [Rand] only seems to grow stronger with time” – Eugene Weekly. Writing and playing music since childhood in the Deep South, Rand cut her performance teeth playing bluegrass in Alaska and spun musical magic with natives in the Amazon. She spent six formative years touring from her remote homestead in the Pacific Northwest wilderness, fully launching her career in California’s North Bay Area, where she remains revered as one of the region’s finest independent artists. A North Bay Bohemian readers’ poll voted her “Best Acoustic Band,” and calls Rand a “legendary…longtime local hero.” In the 1990s Rand helped anchor Seattle’s thriving music scene, collaborating with her songwriter brother, during his last years of life. 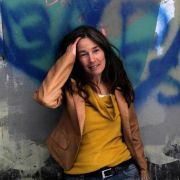 Residing now in Arcata, CA, with her husband and daughter, Rand teaches music, does film scoring, and continues to tour.